From Contrarian Outlook: Today I’m going to show you 3 funds that give you an income stream the taxman cannot touch. These 5% dividends get even more exciting when you see their “real” yields, thanks to that tax-free status. It’s all thanks to unsung municipal bonds, a kind of debt that cities, counties and states issue to raise funds for building roads, bridges, schools, hospitals–all kinds of things that make life easier for their residents. To encourage investors to get into this market, the US government allows the income from these bonds to be distributed to investors without any tax payable at the federal level. A knock on benefit: your muni-bond income won’t kick you up to a higher tax bracket. And if the phrase “municipal bonds” makes your eyes glaze over, this should get your attention, because if you’re in the top income tax percentile, that 5% is the same as getting a 7.7% dividend from stocks, corporate bonds or another investment. Even the lowest tax bracket gets a deal: that 5% is worth 5.6%. And now that everyone is doing their taxes and eyeing their obligations from stocks, corporate bonds and the like, muni bonds are looking like a great idea. Right now there are 3 funds that offer this kind of yield and something even better: a massive discount. And because these 3 CEFs trade at a big discount to NAV, we can invest in their portfolio holdings for much less than we’d pay for these assets on the open market. Let me start with a fund trading at a huge discount: the Eaton Vance NJ Municipal Income Fund (EVJ). This New Jersey-focused fund trades at a 16.9% discount to its NAV. In other words, put $1 in this fund and you’re getting $1.20 in assets. Oh, and the fund’s tax-free 5% yield is extremely appealing, too. The real reason why I like this fund is that it’s been in the market’s doghouse. Although it’s provided a steady 5.1% annualized return over the last decade, it’s actually down 3.7% in the last year. But that’s based on its market price. 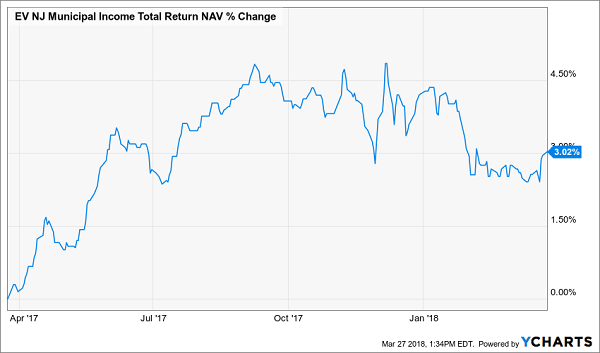 When we look at the fund’s NAV return–that is, the real return it has provided on its assets–we see a different story. The fund has still risen 3% in the last year, in a tough environment for municipal bonds. In fact, it’s beaten the index, as we can see by comparing EVJ to the iShares National Municipal Bond ETF (MUB). 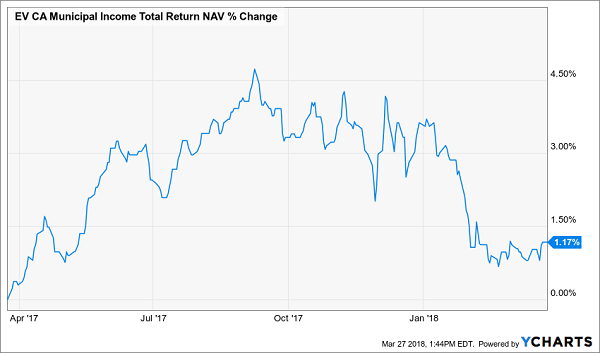 With a total NAV return more than 30% above that of the market’s, EVJ is earning its keep in spades, yet investors are “rewarding” it with a discount that’s the biggest it’s been in more than a year. And that’s why this is a smart tax-free fund to consider. EVJ’s sister fund, the Eaton Vance NJ Municipal Bond Fund (EMJ), is also worth looking at, for similar reasons. 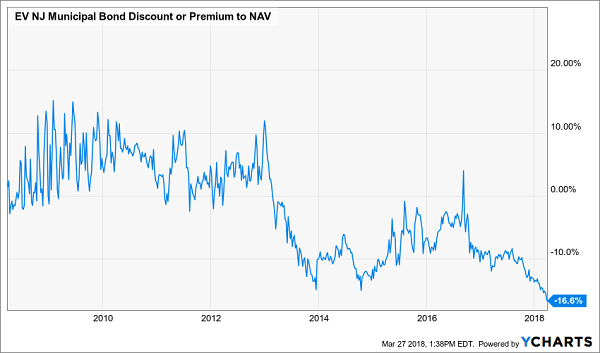 Like EVJ, this is a New Jersey-focused fund trades at a huge discount to NAV (16.6% in this case)–the widest we’ve seen in more than a decade. You might think that this sudden discount exists for a reason, but it doesn’t. 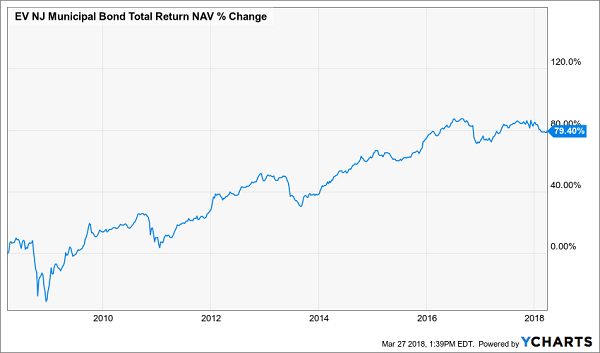 If we look at the last decade’s total NAV return, we see that the fund has been steadily climbing higher. With its 5.1% yield, EMJ is a great income producer. And since the fund also provides tax-free income, that yield is actually worth nearly 8% for investors in the top tax bracket. 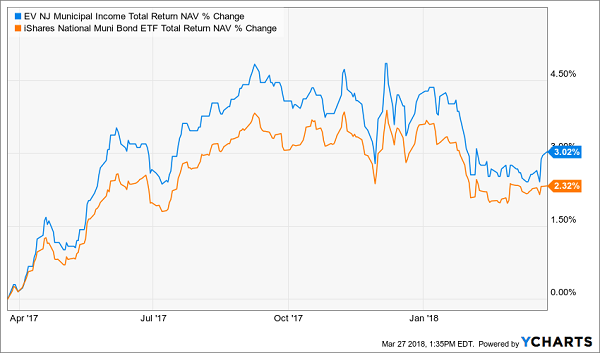 The Eaton Vance CA Municipal Income Fund (CEV) is focused on California and, like the New Jersey funds, it’s trading at the biggest discount in recent memory. 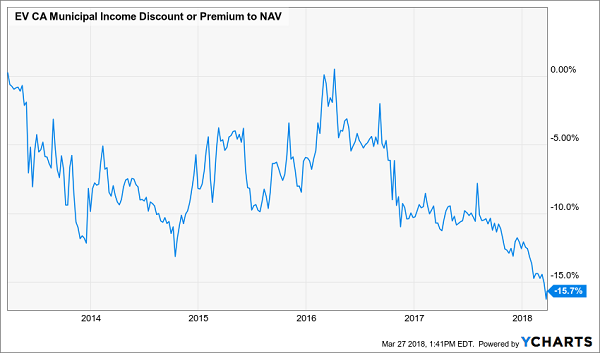 CEV’s 15.7% discount to NAV is way cheaper than the average 5.1% discount the fund has sported in the last decade, and about double the 7.8% average markdown over the last five years. In the last year, CEV has had a strong return–until all of a sudden, at the start of this year, the market panicked. 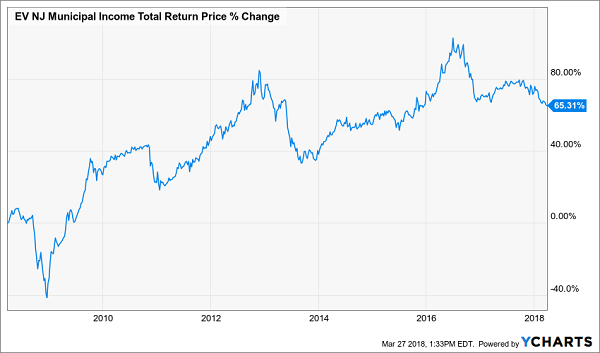 To make a long story short, investors are worried that a booming economy will scare buyers away from low-risk muni bonds and toward high-risk assets like corporate bonds and stocks. This is faulty thinking. Let me explain why. A booming market means California, the home of Silicon Valley and Hollywood, will boom as Americans spend more on tech and entertainment. That will improve the revenue stream for this tax-heavy state and make its municipal bonds look better to investors. And that will improve demand for California bonds and the funds that hold them, including CEV. Until we wait for that, CEV will give us a tax-free 4% dividend income stream, which is why it’s an ideal consideration for investors who want cash now without a tax burden later. No matter if you’re just dipping a toe in the CEF market or if you’ve been profiting from these high-yield cash machines for years, the 3 CEFs I just told you about are a great fit for your portfolio now. But they’re just the start. Because I’m also pounding the table on 4 OTHER funds throwing off fatter average dividends–7.6% as I write–and one of these unsung cash machines even pays an amazing (and growing!) 8.1%. Better yet, all 4 trade also trade at ridiculous discounts! The bottom line? Buy now and you’re looking at easy 20%+ price gains in the next 12 months! Throw in that 7.6% average dividend and you’re looking at a fast 28%+ total return here–with a big chunk of that in CASH! Your opportunity to grab these 4 funds at a steep discount is open now. But these absurd markdowns are already starting to narrow, so you need to make your move! Don’t miss out. CLICK HERE and I’ll give you the names, ticker symbols, buy-under prices and my complete analysis on all 4 of these 7.6%+ dividend payers now. The iShares S&P Natnl AMT – Free Munpl Bd Fd (MUB) closed at $108.93 on Thursday, up $0.02 (+0.02%). Year-to-date, MUB has declined -1.63%, versus a -1.39% rise in the benchmark S&P 500 index during the same period. MUB currently has an ETF Daily News SMART Grade of B (Buy), and is ranked #13 of 39 ETFs in the Municipal Bonds ETFs category.